John Gardner’s Christmas Carols are sung and enjoyed the world over. 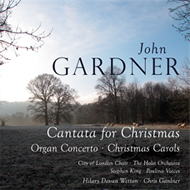 Alongside the much-loved ‘Tomorrow shall be my Dancing Day’ and ‘The Holly and the Ivy’ are some of Gardner’s less well-known carol settings, as well as the World Première recording of the sparkling ‘Cantata for Christmas’ and the intriguing Chamber Concerto for Organ and Ten Players. Recorded at St Paul’s Girls’ School, Hammersmith in October 2012.